This is what my box looked like when I opened it. I was so excited!!! And it came in less than a week! Very fast shipping and no waiting! I was so happy to not be put on a wait list before I could join South Hill Designs. The long, rectangular boxes are what I found first. I had three total. Two were the regular random kit items, and the third was my own purchase. Because what you get with a Social starter kit is random, it is highly recommended that you add on to your order the items you want for your own locket/s. And guess what?! Anything your purchase with your Social starter kit will be priced at wholesale for you! 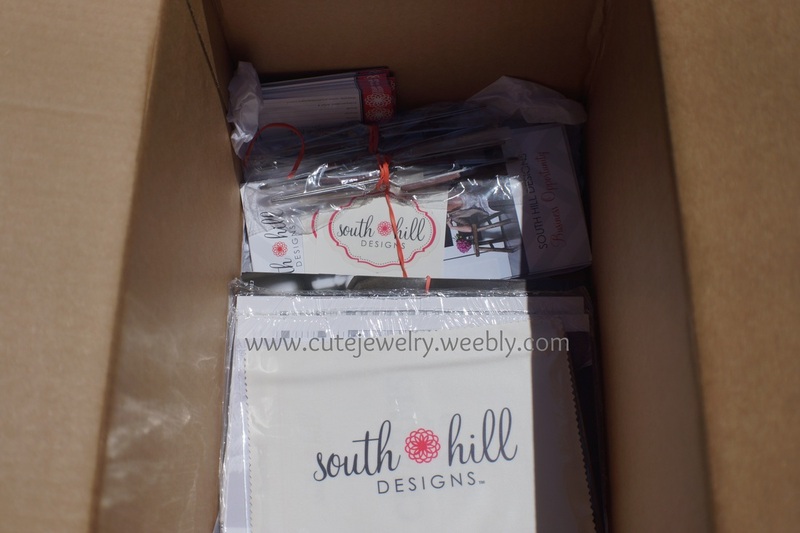 As you can see, South Hill Designs is EXTREMELY careful in their packaging. Everything was securely packed with tissue paper to buffer the travel, and anything slightly breakable was wrapped in bubble wrap. After I removed my fragile things, I found my tweezers and all of the paperwork. I also found my Square Card Reader. When you place your Social starter kit order, don't forget to go all the way to the bottom of the list and figure out what office supplies you need/want under the "Party Supplies" tab. The Square Card Reader is FREE! You also have the chance to order gift bags, extra catalogs, order forms, etc. 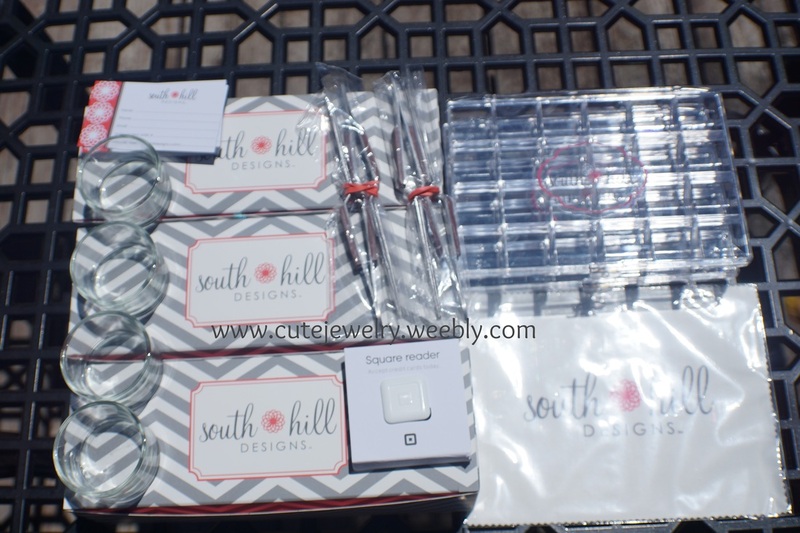 South Hill Designs sure has us covered! 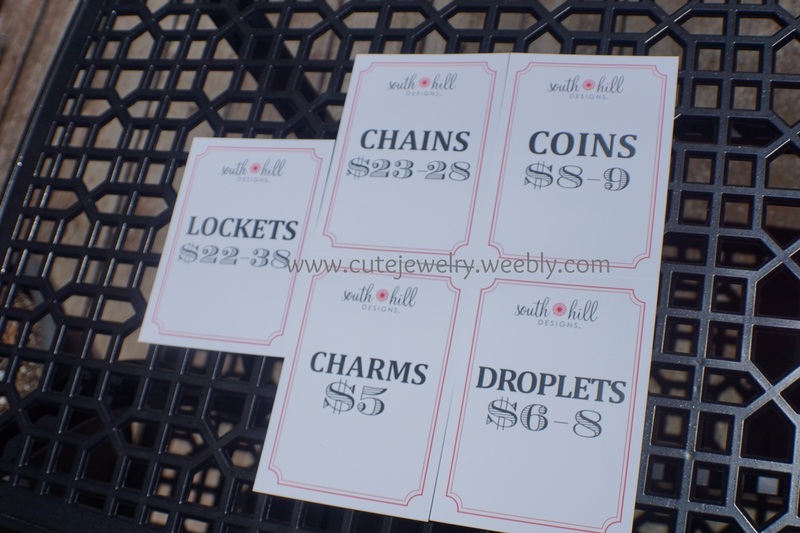 The smaller rectangular boxes held five small square boxes (each containing a locket) and a separate section that held bags of charms, chains, screens, coins, and droplets. 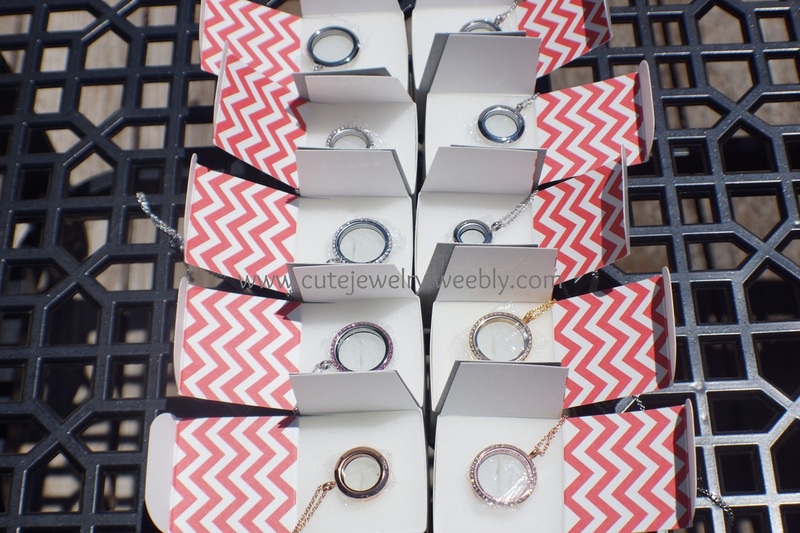 Also, in each box there were five "Jewelry Care Cards" to go with each locket. Score! The Medium Social starter package (at this time) comes with 10 lockets. 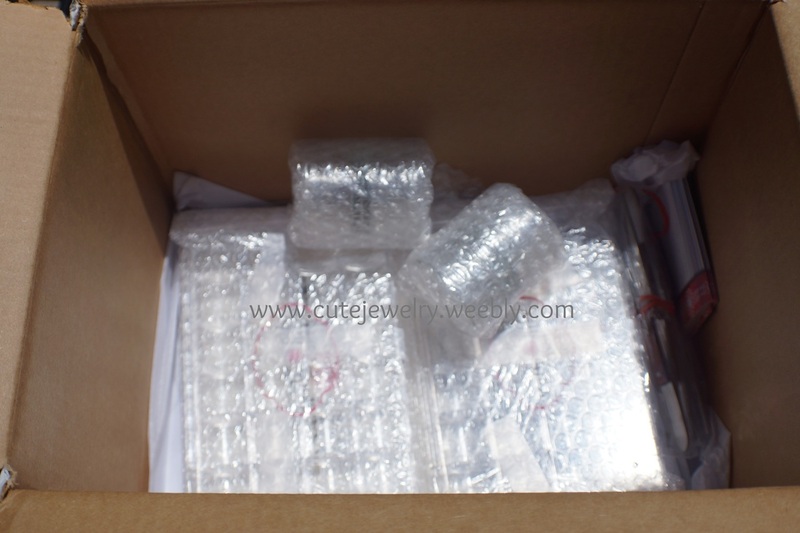 These are the lockets I received: 1 Large Gold Crystal, 1 Large Silver Crystal, 1 Large Rose Gold Crystal, 1 Large Silver with Pink Crystals, 1 Large Plain Silver, 2 Medium Plain Silver, 1 Medium Rose Gold, 1 Medium Silver Crystal, and 1 Mini Silver. Only one duplicate! And a great duplicate, as the Medium Plain Silver is a great seller! You can't run a business without paperwork! At this time, the Medium Social starter kit comes with 10 Catalogs, 10 Hostess brochures, 10 Opportunity Brochures, 20 Order Forms, and 1 Month Back Office ($9.95 normally). Your Back Office controls everything. This is where you find your online sales, your rank, your orders, organize socials, place your social orders, and get all the tools for running a successful direct sales business. This is something all direct sale companies charge for, and is a must have! Also included (but not mentioned on South Hill Designs website) are 5 Price Cards. These are great quality and will look perfect in some simple, yet inexpensive black or grey picture frames. The Tote Bag! 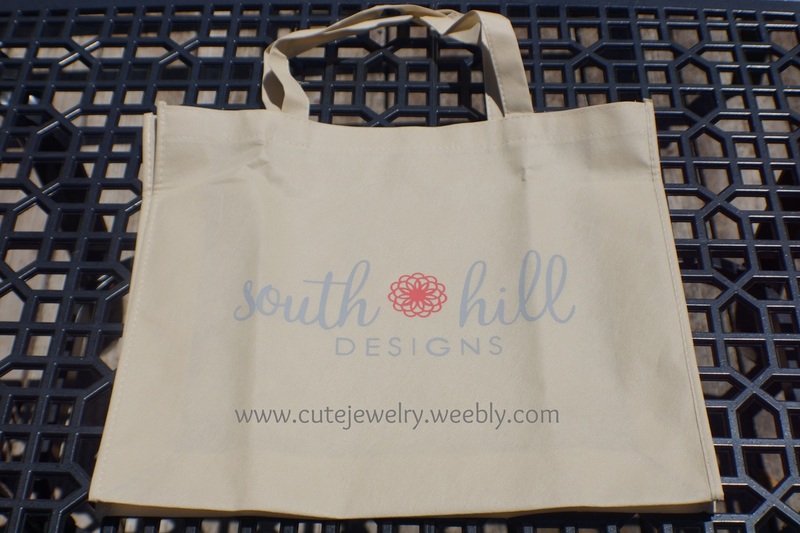 This practical, yet durable tote bag is just the right size to start traveling with your South Hill Designs merchandise. It will hold every thing in your Medium Social starter kit and more! Are you ready to join? Click here! Unfortunately, I don't have a picture of all the charms, droplets, coins or screens. I was so excited to start selling, and opening each tiny bag was like a celebration! I can assure you, I did not receive a SINGLE DUPLICATE! Also, I had a very nice range of charms from every single category. I, of course, purchased extra charms, screens, and droplets for my own (Nothing like beautiful advertising! ), and even with my own purchases, I only ended up with a couple duplicate charms and droplets. 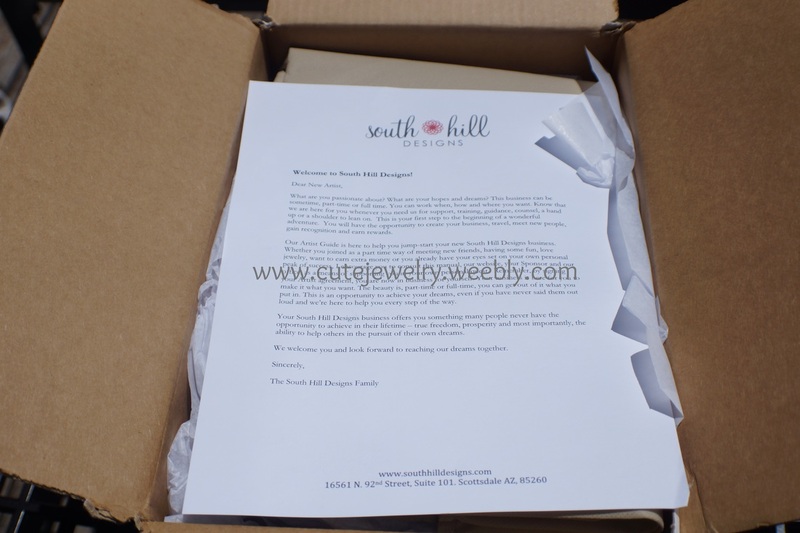 I could not have been happier with my decision to join South Hill Designs, and I was so glad I spent the extra money on the Medium Social starter kit. Come join my wonderful Cute Jewelry team!